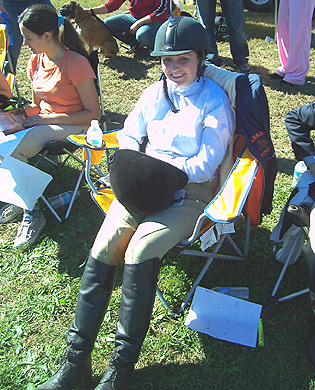 Seen here in much nicer weather during the fall, Erika Mueller of Nassau Community College won both of her novice classes on February 17th and helped her team win high point honors in the process. Central Islip, NY - On February 17th the Nassau Community College Equestrian Team hosted their intercollegiate horse show to kick off the new season. And what a way to start off the season but to be the High Point Team Champions out of 11 colleges such as NYU, Yale, CW Post, Fairfield, Stony Brook and Dowling to name a few. For the NCCET this was a special feat especially at their own show and it couldn’t get any better that their own rider, Erika Mueller, was the High Point Champion Rider, another first for this team. Erika won both her Novice fence and Novice Flat classes, putting her in a tie with two other riders. After riding in the ride-off, Erika was declared the champion! Way to go Orka, we are so proud of you! The team was very successful in all their classes. Thank you to all our supporters, sponsors and to all the volunteers and parents, you made the show! A special thank you to Emma for staying out all day to hold the horses. You rock! (More to say: None of the top four open riders had a stellar day, leaving the Region 4 USEF Cacchione race generally unchanged...New York University gained another point on second place Fairfield, giving the Violets a 14 point lead on the Stags with two shows remaining...the nation's largest body of alumni also can claim the most Regional Qualifiers at the moment, with six alumni riders now in on the flat. Three of those six riders are also qualified for Regionals over alumni fences...Regionals will be Sunday, April 6th at Country Farms, site of Hofstra's Fall show. Zones will be at Skidmore College in their Van Lennep Riding Center later that week, only the second time this season anyone in Region 4 will compete in IHSA competition on a Saturday - Editor). Team Totals: Nassau Community College (High Point Team) 32; St. Joseph's College (TIE-Reserve) 30; New York University (TIE-Reserve) 30; Fairfield University 29; Stony Brook University 29; Columbia University 24; Long Island University - C.W. Post College 23; Yale University 22; Hofstra University 19; Dowling College 17; Molloy College 10 and Sacred Heart University 8.